Corporette® has been called the “go-to source” for professional but fashionable women, and was #2 on Forbes’ list of the Top 10 Lifestyle Websites for Women. The site has been recognized by the ABA Journal as one of the “Top 100 Blawgs” for five years in a row, and made Forbes’ list of the Top 100 Websites for Women for all four years the list was in existence. In 2016, we were honored to win the bronze medal for “Website of the Year” for The Stevie Awards for Women in Business. And way back in 2009, we were happily surprised to be nominated for a Bloggie for “Best-Kept Secret Weblog.” We’ve been honored to receive mentions in The New York Times, CNN/Oprah.com, Real Simple, The ABA Journal, The National Law Journal, Forbes, Above the Law, Business Insider, The Muse, Jezebel, Bustle, Mic, Refinery29, Quartz, Lucky Magazine, Fashionista, People StyleWatch, Glamour Magazine, Allure, Working Mother magazine, the Wall Street Journal’s Law Blog, the Wall Street Journal’s “The Juggle” blog, Law.com’s Careerist Blog, The Huffington Post, LearnVest, and more. 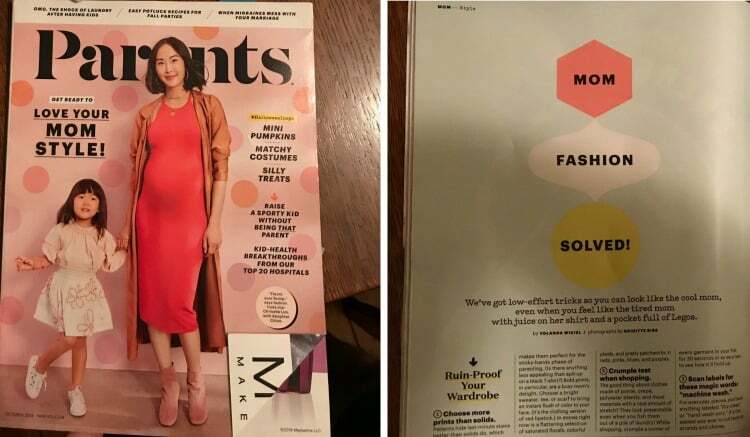 Kat was quoted on behalf of CorporetteMoms an article called “Mom Fashion Solved!” in the October issue of Parents. The New York Times quoted Kat in an article called “What Business Casual Really Means,” while Business Insider featured that advice in its own story. Business Insider also asked Kat for advice on what to wear to work in the winter. Kat joined Kathryn Rubino on the first episode of the Above the Law podcast The Jabot to talk about workwear and more. Business Insider quoted Kat in an article about figuring out whether or not you need a suit for work. Business Insider also quoted Kat in an article about budgeting for workwear. Insider interviewed Kat about tips on buying your first work wardrobe. Open Systems Technologies included Corporette in their list of favorite career blogs. Mic talked to Kat for an article about the five types of purchases you shouldn’t cut corners on, including workwear. The Detroit Free Press suggested Corporette as a resource for dressing for summer internships. Credit Donkey included Corporette on its list of Best Career Blogs for 2017. The One Legal blog included Corporette in their list of 25 Twitter Accounts All Legal Professionals Should Be Following. PowerToFly included Corporette in its “5 Things We Love This Week” post for the week of May 23. The Happy Lawyer Project interviewed Kat about the blog and about her career in general. Ambi linked to a Corporette post on dressing for your shape in a post on the company’s blog. Dress the Part included Corporette in a post recommending 50 fashion blogs. Corporette won a Bronze Stevie Award in the “Website or Blog of the Year – All Other Industries” category in the Stevie Awards for Women in Business. The Careerist quoted Kat in their post about the outfit Fox News’ Megyn Kelly wore while reporting from the Republican National Convention. Bustle referred to Kat’s past advice in an article about what to wear to a job interview. Bustle quoted Kate’s post on making time for friends in an article on the same topic. Paysa’s blog interviewed Kat as part of its Expert Interview Series. Après included Kat when they asked several career experts to name their favorite business books. The American Lawyer quoted Kat in a piece on women lawyers and pantyhose. Kat accepted an invitation to ask a question of Nina Garcia, Project Runway judge and creative director at Marie Claire, during Garcia’s appearance on HuffPost Live. The Legaler Blog featured an interview with Kat about workwear fashion. Refinery29 quoted Kat in “Olivia Pope Be Damned: This Is What Women In Politics Really Wear,” an article about workwear style in Washington, D.C. The Styling Dutchman mentioned Corporette in a roundup of the best work fashion blogs for professional style inspiration. Business Insider cited this post on lightweight pants in an article on dressing professionally in hot weather that appeared in its Indian, Malaysian, Indonesian, Singaporean, and Australian editions. Classy Career Girl included Corporette in its “10 Best Sites For Work Clothes Inspiration” list. Corporette was mentioned by Sarah Samuels, an honoree on the Chief Investment Officer Magazine “40 Under 40” list, as one of her three most visited websites. Samuels is senior investment officer at Massachusetts Pension Reserves Investment Management. Conscious Careers included Corporette’s “Career Advice” Pinterest board in its list of 44 Pinterest Boards to Follow to Get More Conscious About Your Career. Kat’s advice was cited by Chartered Management Institute (UK) in an article about the future of the business suit. Corporette was mentioned in “Parsing the Visual Rhetoric of Office Dress Codes: A Two-Step Process to Increase Inclusivity and Professionalism in Legal-Workplace Fashion,” published in in Legal Communication & Rhetoric: JALWD. The Work at Home Woman named Corporette one of the 50 Best Blogs by Women. Real Simple quoted Kat in their guide to Work & Your Wardrobe (September 2014 issue). LJNRadio spoke with Kat about dressing fashionably but professionally. Business Insider featured Kat’s advice in an article on what not to wear to work in the summer. StyleCaster quoted Corporette’s Guide to Basic Women’s Suiting in an article about what colors to wear to a job interview. The Careerist quoted Kat in an article on nail polish at law offices. Quartz mentioned Kat’s onetime black-suit-and-lime-green-socks ensemble in an article on wearing “wacky” socks to work. FlexJobs named Corporette one of the 5 best blogs for working moms. Fashionista quoted Kat in an article about the best stores for women’s workwear. Love Your Job interviewed Kat about her career so far. People StyleWatch quoted Kat on five ways to look great at work. The ABA Journal picked up our discussion on how to express gratitude for bonuses. We’re honored to be nominated as a Top 100 Law Blawg again by the ABA Journal! The Careerist quoted Kat in an article about tights with open-toed shoes at work. REALTOR Mag quoted Kat in an article on finding the right balance between chic, classic, and comfortable. Kat’s journey from lawyer to blogger is included in Liz Brown’s new book, Life After Law. Money Under 30 asked Kat for some tips on how to build a work wardrobe on a budget. Diane Gottsman, modern manners and etiquette expert, included Corporette in her list of Facebook links to include in your routine. Forbes named Corporette to their “Top 100 Websites for Women” list for the fourth year in a row — what an honor! Become Gorgeous included Corporette on their list of the Best Women’s Blogs to Follow. The ABA Journal summarized Corporette’s article on how to recommend friends in a professional context. Canadian blog Precedent featured Corporette as one of the best work-style blogs. The ABA Journal pondered how much you spend on work clothes, and cited Corporette. The WSJ mentioned Corporette as one of the presenters at the Fashion 2.0 awards. Entrepreneur Magazine rounded up Kat’s tips for how to dress as a women entrepreneur. Levo League quoted Kat and Corporette with advice on how to dress professionally in bad weather. The Grindstone quoted Kat in an article about whether coworkers judge you based on your engagement ring. The Jane Dough quoted Kat in an article about whether loving fashion was anti-feminist. Cosmopolitan Magazine quoted Kat in an article about how to be a great mentee. Independent Fashion Bloggers quoted Kat in an article about covering brands or products that you don’t like. What an honor: for the fifth year in a row, Corporette was nominated to the Top 100 Law Blawg list by the ABA Journal. Business Insider included Corporette in its list of the 15 Most Influential Law Blogs. Kat and Corporette were mentioned on Forbes.com, What Your Business Card Says About You. Kat was featured in The Financial Times article, Bloggers on Fashion’s Front Row. Kat was quoted in The Grindstone about wearing fur at the office. Kat was also featured as a style expert in Real Simple in a piece about whether certain items of clothing (e.g., jeans) are acceptable in corporate, business casual, and creative offices. Kat was featured in Redbook as one of three fashion bloggers who shared their back-to-school picks for parents and kids (and modeled some, too). Kat appeared as a talking head on Huffington Post Live, talking about whether men embellish their resumes more than women. Kat was cited in September’s People StyleWatch, weighing in on cocktail meetings with coworkers. The Grindstone and Business Insider quoted Corporette and Kat in an article about curly hair at the office. Kat was quoted in the August 2012 People StyleWatch on how to wear prints to the office. Kat was featured in an article on IFB.com about when to go pro as a blogger. The Grindstone quoted Kat about whether high heels can make you seem more career savvy. Forbes named Corporette to its Top 100 Websites for Women for the fourth year in a row. Jezebel quoted Corporette extensively when a professor recently advised female law students to wear skirt suits because they were “more appealing” to men. Radio station WTOP cited Corporette as a resource for interns to know what to wear. Above the Law quoted Kat in an article about what to wear to the office pool party. People StyleWatch interviewed Kat about work trends in their June 2012 issue. Reality Chic interviewed Kat on blogging, NYC, and more. Kat was quoted in an article in The Grindstone regarding whether women lawyers have the strictest dress code. Kat’s style advice is featured on The Limited’s Facebook page. Kat was featured as a style expert in the May 2012 issue of People StyleWatch. On January 25, Kat was featured in the “professional blogger spotlight” on Independent Fashion Bloggers. On December 1, Corporette was nominated (for the fourth time running!) for the ABA Journal’s “Top 100 Blawgs” in the “Just For Fun” niche. On November 8, The Careerist quoted Kat’s take on leather skirts at the office. Kat was quoted in the September issue of People Stylewatch Sept 2011_0001. In September, Allure Magazine gave Corporette a shout-out in an article on whether colorful nails were appropriate for the office. Kat’s post on leadership skills was quoted by the ABA Journal. Corporette was chosen by Forbes as one of the Top 10 Lifestyle Sites for Women, and included in their roundup of the Top 100 Websites for Women. Kat and Corporette are featured in the July 2011 Lucky Magazine (page 68); she also guest-blogged for them for the week of June 13-17. The Careerist quoted Kat, who opined that 3-4″ heels were the highest most professional women should go. Kat was quoted by The Lawyerist for an article on women’s bags. Kat was chosen by StyleFind, InStyle’s sister site, as one of 14 bloggers to choose an “it” bag for the season. Kat was interviewed by Jessica Gold for Truth Plus. Kat was quoted in The New York Times, opining on whether yoga pants are appropriate for work. Law.com’s The Careerist mentioned Kat’s post on how to quit gracefully. Kat was quoted by The Little Pink Book. Corporette was selected for the third time in the annual “Top 100 Law Blogs” by the ABA, and they even wondered whether Kat might be one of the top bloggers to meet. The Careerist quoted Kat on law firm hiring practices. Kat was interviewed by Jane’s Got a Job on how she juggles her blogging and her legal work. 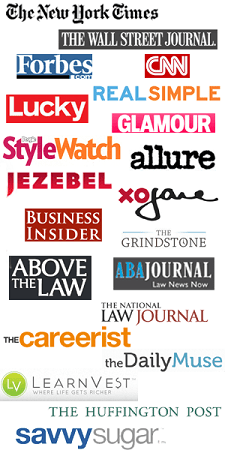 Kat was quoted in Law.com’s “The Careerist” on peep toe shoes. Kat was interviewed on Ganthead. Kat was interviewed for an article on makeup at the office on Endless Beauty.